Historical Organization of the Week: Save Lucy Committee ~ The History Girl! This week, in honor of Lucy the Elephant's 131st birthday, the Save Lucy Committee is being featured. The organization was founded in 1970 by a concerned group of citizens to save Lucy from being demolished. Lucy was built in 1881 but by 1969 had been neglected and was falling apart. The land she resided on had also been sold to developers. 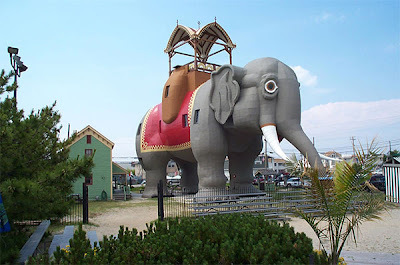 Her demise was impending, but thanks to a heroic volunteer effort, the Save Lucy Committee raised enough funding to move Lucy to a Margate, NJ city owned property a few blocks away. By 1974, the Committee had restored the exterior and the interior support system. In the 1990s the interior and exterior were once again renovated and restored. The Committee has approximately thirty members. Fundraising is on-going to construct an interpretive center to provide expanded and more accessible interpretation as well as to establish an endowment to ensure future maintenance of the buildings and the site.